The Uluru-Kata Tjuta National Park board members, comprised of eight traditional owners and three National Parks representatives, unanimously agreed in October 2018 to ban climbing Uluru on October 26, 2019 to preserve a sacred Tjukurpa site of the indigenous tribe. Tjukurpa’ is the spiritual knowledge gained from the thousands of years the Anangu have lives on the land. The Anangu are wrong—and selfish. If Uluru calls to you, I say climb Uluru. I did. And I’ll tell you why. Uluru is a mystical tuning fork with a Close-Encounters-of-the-Third-Kind-Devils-Tower vibe that magnetically draws over 250,000 people every year to make a pilgrimage to the World Heritage monolith. The spectacular sandstone mountain that looks like an orange iceberg plunked down in the flat desert iconically rises 1,142 feet, slightly higher than the Eiffel Tower, and is 5.8 miles in circumference. The Rock is 208 miles southwest of Alice Springs in Australia’s vast Northern Territory. In 1873, Uluru’s first climber, European surveyor William Gosse, named it “Ayers Rock” after Sir Henry Ayers, the Chief Secretary of South Australia at the time (Naming the place after your boss is an early form of exploratory job security.). Visitors have been clambering up Uluru’s steep flared face since the thirties. In 1964, two deaths six weeks apart led to a 1966 decision to install a chain-rope linked by three-feet-high stanchions grouted into the Rock’s steepest sections of the climb. In 1980, the gazetted handrail was extended as 5,250-foot path. At the gated entrance to The Climb, there’s no chain for the first 300 feet, which is called the “chicken climb” for those who go up that far, snap a picture and turn back. In 1950 Ayers Rock became a national park, then in 1995, the name was changed from "Ayers Rock - Mount Olga National Park" to "Uluru-Kata Tjuta National Park." It’s one of the few properties in the world to be dual-listed by the United Nations Educational Scientific and Cultural Organization. As part of the 1983 Aboriginal Land Rights Act that recognizes “dispossession and displacement of the indigenous First Nation people,” Uluru was handed back to the Anangu in1985, which includes its surrounding 512-square-mile desert stretch. But the territorial-reconciliation deal had two conditions, one of which became contentious: lease the land to the Australian National Parks and Wildlife Service for 99 years, and Uluru must remain open to climbers. The recent push to ban climbing was outlined in the park's 2010-20 management plan, where the climb would be closed if attendance numbers dropped under 20% (Only 16% of visitors made the climb between 2010-15, according to board data. But then again, if more and more people visit it, why isn’t 16% adjusted to reflect an increase in climbers?). . Park officials have stated the climbers have worn down a path of Uluru, changing its face. Be serious! Do self-righteous officials believe the environmental impact of overpriced waterproof hiking boots is going to irrevocably damage a monolith that has weathered and endured storm runoff and lightning damage for over 500 million years, and is just part of impermeable sandstone-granite bulk estimated to be at least 2.5 miles underground? “It’s just a rock,” indifferently said Bob, a middle-aged business-suit wearing Aussie said in a Sydney bar after I told him I was going to Uluru. But the cocktail-toting Bob when faced with my choice to experience aboriginal culture at the famous The Rock, clearly preferred “The Rocks” in the city’s center, a heavily tourist-infested area, with four-star city restaurants, pubs, and shops near the harbor and the Opera House. I could see Bob’s point, to some, what was so majestic about a rock conglomerate that could easily resemble huge dome light, a giant baked potato, a cupcake some licked the icing off, a raked pudding, benign polyp, a giant dozing transient wrapped in a sleeping bag, an inflamed hemorrhoid or the predatory scarlet crouching mass from The Blob, the 1957 horror movie with Steve McQueen. Perhaps the Grand Canyon had a hernia and this outcropping came out below the equator’s waistline? Or, is Australia’s Red center merely the Down Under’s outie navel in the middle of a desolate volcanic rock-strewn orange-brownish desert that resembles coffee cake covered with scattered dirty Legos and the basil-like lichen in chocolate mouse sandstone chunks dusted with by specks of grated parmesan? You can geomorphology denude Uluru’s cinematic charisma by defining its landform as an inselberg or bornhardt: an arkose-granite-sandstone-weather-resistant rock that rises while the land surrounding it erodes. Or, go full-on Anangu-centric myth (Gunwinggu) that it’s the beginning of creation, and each precise etch in Uluru pock-marked gully, boulder, crevice, cave, cross-bedding, water-eroded groove, and lightning crack represents ancestral events and spiritual beings like Bolung Rainbow serpent, Namarrgon the Lightning Man left dreaming tracks, and where Wurugag and Waramurungundi, who were the first man and woman on Earth. Ka-yikes! I had a hard enough time figuring out the difference between a long black from a flat-white coffee in the Sydney Quay’s café. The aboriginals have ritual journey terms like walkabout, dreamtime, and songline. My walkabout two-step began with my second battle of testicular cancer at Stanford Cancer Center in Palo Alto, California. I hit the first turn-and-cough speed bump of my mortality at twenty-eight, and thirty years later, I had the dubious distinction of being one of those rare and unfortunate five-percenters who gets a cancer-sack sequel in his last remaining testicle. During infusion I was marooned in thinning solitude on a lounge chair and watched cisplatin drip into my carcinogenic body. As I visualized the toxic serum soaking and incinerating the football-sized tumor in my lymph nodes, an apparition of Uluru appeared to me in my chemo-brain haze. Its shape was an empty outlines space within my chest, feeling like the last missing part of a puzzle that only Uluru could solve. My body vibrated with a message that said: You must come here. I made a post-cancer vow to see Uluru. Then again, maybe I was trying to over compensate for my testicular shortcomings by going Down Under. Sunrise and sunset are the most popular viewing times because the rock’s weathering of iron-bearing minerals by the process of oxidation gives its outer surface layer a perpetually pulsating pragmatically shifting red-ochre-orange rusty palette within its charcoal-black crevices and can make its form radiate a primordial majestic splendor. 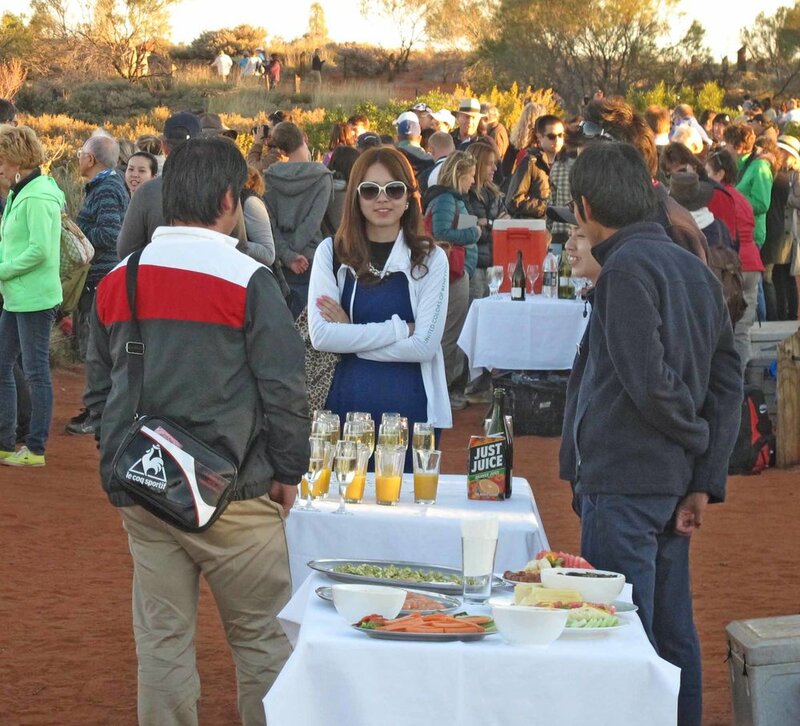 The parking lots near Uluru are jammed with AAT Kings Coach cruise-ship size buses debarking German, French, and Asian tourists, some dressed in costumes, who feast at buffet-hosted tables, sip champagne, and take selfies of themselves with Uluru in the background, as if it’s an environmental rock-star celebrity. Sometimes it seemed like Uluru was shrinking in embarrassment at being pointed at and photographed, but weathered on, a hard red center in the middle of nowhere attempting to rise above it all. Eleven miles from Uluru’s mulga scrubland and strands of bloodwoods, is the Yulara township, which supports a supermarket shopping mall, restaurants, lodges, campgrounds, apartments, as well as upscale luxury accommodations that can cater to 6,000 tourists a day. In 1983 Prince Charles and Diana visited Uluru and posed for a picture, and in 2014, the Duke and Duchess of Cambridge, William and Catherine, regally recreated the same sterile borderline-hermaphrodite-conjoined royal-couple-picture pose. The couple leisurely retired to glamp at the opulent Longitude 131 resort (which is either its geographic location or the height its occupants looked down on those who have to settle for less. ), that is six miles away from the park and has Dune Pavilion suites with dual views Uluru and Kata Tjuta, a 36-dome pile of rocks twenty-plus miles west that looks like prehistoric marbles left by some giant child. While you stay here you’re served a four-course dinner is a lot easier than being a traditional tribesman scrounging for bush tucker in the desert by digging up an appetizer of witchetty grub larvae from shallow bush roots, then getting your entre by pulling a goanna lizard by its tail out of a burrow, cooking it up over a campfire on a stick, and for dessert sucked the yellow buds of the Honey Grevilla. Oh, when Longitude 131 intersects with your wallet’s latitude, the rates range from $1,450 - $4,500 a night and require a two-night stay! And what usually follows in the wake of tourist attraction that draws over 250,000 visitors to any national park? Rude idiots! There have been over 74 climber rescues requiring medical attention alone, caused by visitors leaving the pathway and getting wedged in crevices. A 38-year old man and his daughter were airlifted off the rock because their plastic sandals melted and their feet were so blistered they were unable to climb down. Two young guys decided to race down the last couple hundred feet of Uluru and one wound up in the hospital. Another young Dad, tried climbing in his bare feet with his three-year-old, and the guy wound up with brutal blisters. Hey, no matter where you are, you can’t stop stupid. A wide variety of disrespectful incidents have outraged the Anangu. An Australian football personality Sam Newman was photographed hitting a golf ball off the rock. French-born exotic dancer Alizee Sery filmed herself stripping as a "tribute to aboriginal people and their culture,” while other climbers chose to simply pose naked. Commercial planes are prohibited over the park below 3,000 meters. But it didn’t stop Prince Harry from enjoying a $6000 aerial-sightseeing low-altitude flyover of Uluru, which included loops in a RAAF Prime Ministerial Boeing 737 on the Australian taxpayers tab. Probably the most hilarious the aboriginal hissy fit, was when authors, Alan and Patricia Campbell climbed to the top of the rock and took a photograph of Bromley the bear wearing a wide-brimmed hat with corks, with a length of rope slung over his shoulder for their book Bromley Climbs Uluru in 1993. It sold 45,000 copies. In 2003, the writers where notified by the humorless Central Land Council, a statutory body based in the town of Alice Springs with the authority to protect the interests of traditional Aboriginal land owners, that if the authors reprinted the book with the picture, they could face a fine up to $55,000 due to strengthened federal laws in mid-2000 “protecting the natural and cultural value” of Uluru where “professional photographers must apply for permits and approval to shoot pictures in the park precincts.” Come on, tribal elders who believe in Uluru’s mythic legends get bent out of ancestral shape over a cartoon bear in a children’s book? Let Kuniya the Woman Python, Kalayathe the Emu, Lungkata the Blue Tongue Lizard, Luunpa the Kingfisher worry about it! I assume the controversy died down because the republished book with Bromley’s picture on the cover is available on Amazon. But, if no one was ever allowed to climb Uluru, Lindy “The dingo took my baby” Chamberlain would have served a life sentence for a murder she didn’t commit. A story depicted in the film A Cry In The Dark, and a definitive book Evil Angels by John Bryson, where the Chamberlain family camped by Uluru in 1980, and Lindy claimed a dingo entered a tent and ran away with her baby daughter Azara. On what was later proven to be faulty forensic evidence, the Northern Territory police charged her with murdering her child and disposing the body, which was never found. In January 1986, Lindy was exonerated because an English whack-job on an unauthorized evening climb fell to his death in a dingo-laired laced area. Eight days later, police looking for the hiker’s bones discovered the white matinee jacket Lindy claimed the infant was wearing when the dingo took Azara, which proved a dingo not her mother, killed her child. Today, the Chamberlain’s campsite no longer allows camping at Uluru. “Young blokes do so many stupid things here,” sighed Neil gazed at people climbing Uluru and shook his head in disappointment. The aboriginal disparage the plodding hunched-over–chain-link-clinging climbers as “minga” (“ants” in the Pitjandara language—“who blindly follow one path up and one path back” on Uluru.). In 2015, an aboriginal named “John” cut the climbing chains to stop tourists and elders called him a “hero.” The tribe takes offense at the “The Climb’ that desecrates their sacred land into a Disneyland-like theme park, but that doesn’t deter the Anangu caretakers from receiving 22.5 percent of $25.00 three-day passes paid by minga. Somehow their ancestral Tjukurpa laws includes a waiver that gives the tribe sole rights to undertake commercial activity in the park (In English the Tjukurpa has another meaning: “ca-ching”). I didn’t tell Neil was planning to climb Uluru. I figured he’d get mad at me. As I walked away from him, I thought why am I the bad guy? The disrespecting minga? What about the restricted tribal settlements in Uluru’s shadow who have long-standing aboriginal-self-created problems of alcohol abuse and petrol sniffing, which resulted in a government inquiry into the sexual abuse of children? So, when it comes to non-aboriginals connection with Uluru and a claim on the land, how about grading the rest of us on a curve? The six-mile base walk around The Rock takes around three-plus hours. During the hiking route I passed older people sitting on benches at rest areas and exhausted tourists who thought renting a bike was a good idea until their tires consistently got mired in the sandy dirt and were now drearily shuffling beside their bikes. I passed an aboriginal tour guide at a cave, who was addressing a group about the rock’s ancestral beings, then abruptly launched into a indignant rant on how settlers slaughtered peaceful tribes, stole land, displaced families, destroyed their way of life, and keep going on and on in righteous et cetera. A disgruntled woman walked away and muttered to me, ‘He was pushing his barrel.” I stopped numerous times to take pictures of the formation until I came to one of the fenced-off sensitive sites around the base. A cultural handbook instructed visitors not to take pictures because “in our law it is both unsafe and forbidden for men to enter or look intently at women’s sensitive sites, and for women, children and uninitiated men to enter or look at men’s sensitive sites.” I lowered my camera and respected the site, but I was also wondered how long the Anangu’s segregated culture would endure. The park is federally funded and had an operating cost of $15,306,000 in 2013-14 and received external revenue of $6,778,000, largely made up of ticket sales. One has to wonder how the minga money is going to alter the traditional male-elder aboriginal tribal laws, when the women might want equal rights and their cut of the revenue. I met quite a few Aussies who resented the tribal handover. If I said “Uluru” they crisply correct me, "You mean Ayer's Rock," because they believe the land belongs to everyone. These remarks were often followed by the person referring to aborigines as "abbos" and viewed them as bums whose lives were supported by taxpayer welfare. Toward the end of the base walk, I sat down on a branch-tree shaped bench next to an Aussie named Daryl. He was thin but muscular guy in his fifties, who wore a faded and frayed-brimmed Bushman Akubra hat, spent many years in the Outback, and lived in a Kakadu mobile home park. He shared his insights and experiences with the aborigines, “The worst enemy of the aborigine's religion. They make a big mistake of not seeing the white man as a spiritual person. We have been through how many thousands of years of how many religions and beliefs? What the white man doesn’t understand is he talks to the aborigine the way they talk to a white man, and the aborigines hate the white man, these people are in deep pain and misery for the loss of their land. We’re not talking about a long time here. We’re a young country. But these are people in pain. That’s why the drugs and alcohol. But they haven’t been anywhere in their lives but here. Once they get a chance to get on the white man’s plane and see other lands, well, an aborigine woman I know who married a white man came back here after seeing France and Europe and said, “Why do I care about Tjukurpa? The deal is the aborigine have to get over the loss of their lands and take a step into the new world, and the hard-core Australian has to stop thinking of them as a people who are in their way.” He paused. “We don’t see many Yanks. Did you leave your gun at the door?" It was intimidating to be a weathered and coarse-grained, testicle-stripped 59-year old man standing within the end and beginning of my dream track at the foot of The Climb. Dreamtime is where you develop a worldly knowledge accumulated through ancestors—well, there’s no hare wallaby man in my family’s ancestral history. But, now that I think of it, my ex-brother-in-law might have been one. And songline is dreaming a path which mark the route followed by localized "creator-beings ”across the land or sometimes the sky—well I flew Economy on Quantas.). And now, here I was at my Uluru. What made me decide to go full-on minga and ignore the tribal pleas not to climb it? I dialed back to where I experienced a different climb, standing before the Infusion Clinic’s doors faced with a choice going through them to live or walking away to die. If I didn’t climb Uluru, an inside-out void would define me for the rest of my life. A spirit needed to fill me. I didn’t know what it was, but I knew it was somewhere up that slope, hovering beyond me, and I had to be there to meet it. Uluru belongs to anyone who wants to become part of it. Why turn it into an aboriginal members-only Mecca? A cultural pamphlet stated “the climbing route is a sacred path of spiritual significance that is only taken by few Aboriginal men on special occasions.” Well, this walkabout in dreamtime is a special songline occasion. Last time I checked we are all on Earth. We’re all indigenous. I’m a “localized creator-being” too! And now, it’s my turn. A few minga-chain-clinging hours later, I softly settled in a rocky curve atop Uluru. I stared at my orange-dusted hiking boots, sucked water through the tube from the bladder in my knapsack, and tilted back my hat. I looked up at the sun, took a breath, and savored my walkabout climb. I was true to my songline. My dreaming brought me here. Aboriginal places become sacred sites at Uluru because Dreamtime beings traveled through or performed some action at that particular place and are still considered to be performing that action. And in this world of mortality and wonder that’s what I did. I didn’t lose my scenic resolve. I felt the empty piece of my puzzle within me being filled and snapping into place. A mystic thrum of my red-heart pulse emerged from cancer’s wasteland into a binding synchronization with Uluru’s rising presence. It was giving me strength beyond myself that I could only achieve by being here, The Anangu aren’t the only ones with Tjukurpa. Uluru speaks many languages. Aboriginals aren’t the only ones who have a lock-on experiencing loss and desiring to preserve their culture. The longer we all live in one place we remember when it was better. My hometown isn’t the same. There is overdevelopment, traffic, and many locals left because they no longer afford to live there. We have all lost friends and family along the way. Call me a minga, but from where I sat, the only people who resemble ants are the ones below who never experienced the spiritual climbing thrall of this view. Uluru is a sacred site to the Anangu, and now it was a sacred site to me—and Mom. On my last day at Uluru, I left the hotel and walked up a dirt path to elevated viewing platform in the desert to watch the sunrise. There was one other person there, a man who in his seventies from Ireland. We nodded at each other and reverently let the monolith’s reassuring reddening center’s after-glow reflect and soak into us.